Traditionally on Wednesdays during the Advent & Lenten seasons we enjoy the company and soup of our fellow worshipers at 6pm - before the 7pm Service starts. Join us for the potluck and bring your favorite recipe! SUNDAY, DECEMBER 2, 2018 3pm-5pm. A good old fashioned time of crafting holiday decorations brings families together and starts off the Advent season (and new Church Year) at Peace. Then the midweek services get going for the first three Wednesdays in December - starting with a soup supper at 6pm before the 7pm Advent Service starts. Join us (even if you don't have any soup to bring)! This season isn't so much about giving of ourselves but is primarily about God giving His Son, our Savior, to us! For that we gladly return our thanks. Advent prepares us for the arrival of the newborn King, Jesus our Emanuel (God with us). 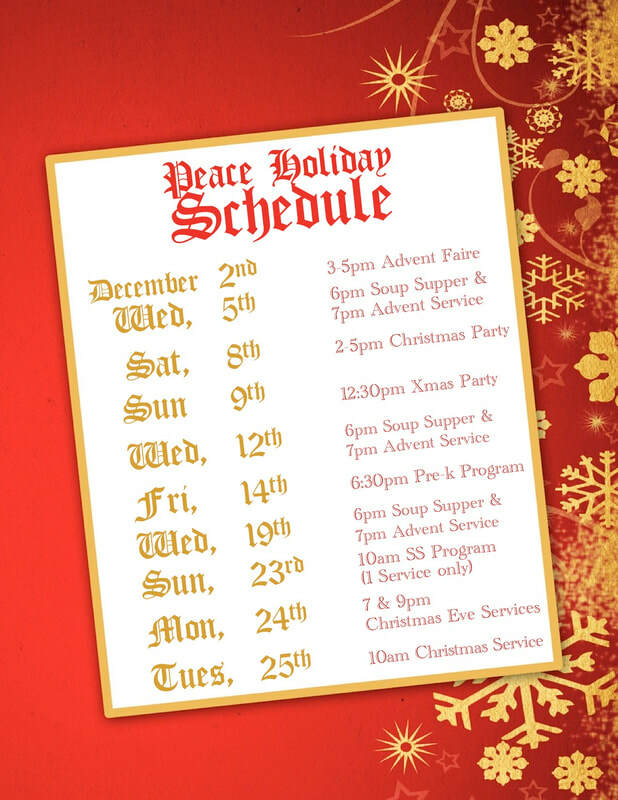 The Christmas season is punctuated at Peace with several special seasonal programs (Preschool & Sunday School), as well as two candlelight Christmas Eve Services (at 5pm & 7pm with special children's messages). A Christmas Day Service at 10am includes Holy Communion. The 40-day season of Lent begins with Ash Wednesday (3/6/19). It's hard to determine when Ash Wednesday falls each year, as it (and Easter) are based on the lunar calendar. So, best check our calendar. While Ash Wednesday, itself, arrives without soup, it marks the start of soup suppers in the subsequent weeks. Lent leads us up to Palm Sunday when the children typically process into the Service with palm branches to praise the King of Kings and begin Holy Week observances. Holy Week begins with the high praises of Palm Sunday and quickly plummets to the somber and sorrowful reflection of our own sinfulness and the integral part it played in the betrayal of our Lord Jesus (observed at 7pm Maundy Thursday) and His crucifixion (observed at both 12 noon and again at 7pm on Good Friday). As great as that sorrow is, it turns to an even greater joy, however, on the third day, Easter Sunday, when we celebrate Jesus' Resurrection and His victory over sin, death & the devil! A church-wide banquet and an Easter egg hunt for the kids round out the Easter morning jubilation. 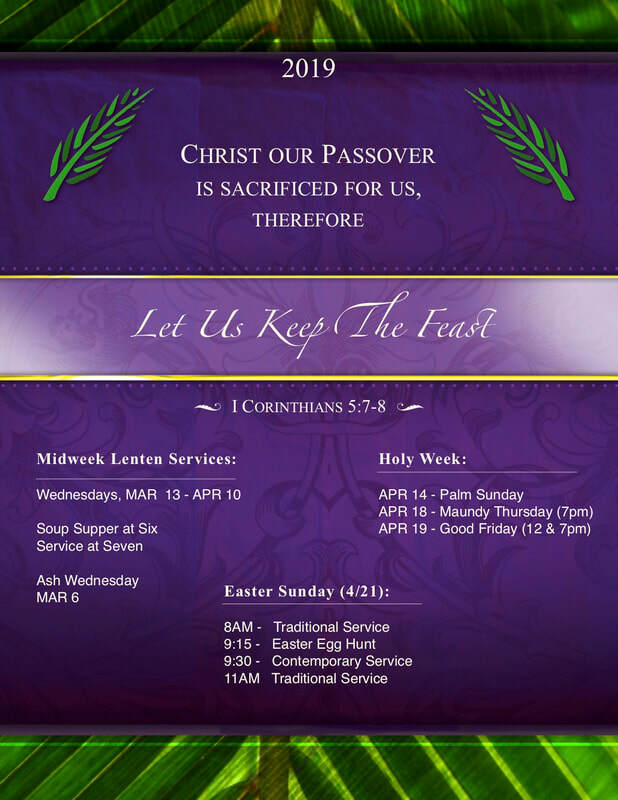 Easter Sunday Services are at 8 & 11am (traditional) & 9:30am (contemporary).